Dear Dorothy: Long ago dining was no ordinary affair at the Metropolitan Museum of Art’s restaurant. It was a memorable experience with its regal reflecting pool topped by skipping water sprites, and above hovered huge iron birdcage chandeliers. “Isn’t this a marvel?” my companion said. “It’s the best ambiance in town.” Indeed I did agree. The design environment was an incredible style, a fairytale-like setting enhancing the pleasure of our self service lunch. As we sat at a table at the edge of the reflecting pool we took it all in as the rightful ownership of typical New Yorkers. The birdcage chandeliers were pure decoration for no birds were noticed, but I shall never forget that it was Dorothy Draper who installed this enchanting environment, which was nicknamed "The Dorotheum." Sadly the restaurant no longer exists. Gone is the reflecting pool, the darting water sprites and the birdcages, all banished to oblivion and replaced with the museum’s new wing. To Dorothy, public space represented a place for people to come and feel elevated in the presence of great beauty, where the senses could look and feel and absorb the meaning of a quality of life. Her design vision looked away from the period room styles of the past and moved forward into modernism with what became known as “the Draper touch.” Her oeuvre embraced an explosion of vivid, splashy colors, oversized prints, aristocratic flourishes like big, Baroque white plasterwork and most striking chessboard tile floors. Most stunning was her signature ‘cabbage rose” chintz, paired with bold stripes and intricate mirror frames over fireplaces. It was refreshing it was daring, it was the new wave of decorating with panache. Carleton Varney, the biographer of “The Draper Touch,” said of his mentor, “People came to Dorothy because she did the unexpected, and had this brilliant sense of color. She took a world that was drab and dreary and made it colorful. In 1937 she made the Hampshire House like an English country house with flowered chintzes. Dorothy was wealthy and had every social credential, which is why all the best hotels in the world came to her. Dorothy hardly bothered with private homes; her creative and unique style was reserved for hotels and large spaces which were her métier.” Her society friends admired her particular blend of French and English elements and her distinctive taste gave her the ability to take control of a hotel project in all aspects of design right down to the designs for menus, matchbook covers, and the staff uniforms. 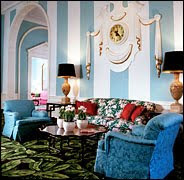 As such she decorated the sprawling Greenbrier Hotel, White Sulphur Springs, West Virginia in an enchanting blaze of color, stripes and chintz. Decorating was not a recognized profession back in the 20s and 30s and decorating was mainly a male dominated occupation. Although women of a certain class did not work back then that did not stop Dorothy. With no other credentials than her incredible good taste, sense of color and decor Dorothy Draper became a self-taught decorator (no professional schools existed) and opened the Architectural Clearing House, arguably the first ‘official interior design business in 1923. Therefore, Dorothy Draper stands alone as the first person to “professionalize” the interior design industry in the United States. In her day, Dorothy was the prima donna of the decorating business. Talk about branding Dorothy had it all. 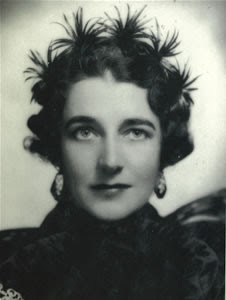 She gave decorating advice in her regular column for Good Housekeeping magazine, designed fabric lines for Schumacher, furniture for Ficks Reed, Heritage, and also designed theaters, department stores, commercial establishments and private corporate offices. Dorothy dominated the decorating business well into the 50s and designed the interiors of jet planes (Convair & TWA). She did a line for Package and Chrysler in the 1950s including a pink polka dot truck. The cosmetic industry acquiesced to her genre enlisting her creative for the Dorothy Gray cosmetic firm. No doubt, it bodes well if you’re born into the right circles and have acquired class, bearing and distinction. No wonder Draper was able to parlay her blue-blood background into big business, particularly at a time when it was considered daring for a woman to go into business for herself. She had connections to the high society social world. Born a Tuckerman, to a wealthy and privileged family in 1889, the six foot tall debutant from Tuxedo Park grew up in New York surrounded by the best of American upper-class WASP style. Like so many young women of her era she wanted out of the confines of this society and did so by marrying Dr. George Draper, FDR’s personal physician and brother to actress Ruth Draper. However, when her husband asked for a divorce in the 1930s, it was almost a fortuitous ending to her marriage; her ambition took off with new zeal and highly visible commissions followed. Much of Draper’s oeuvre survives to this day. Imitators may aspire to create the Draper Touch but can never truly repeat her brand of creativity. Her eye-popping colors and never before seen combinations, such as aubergine and pink with a splash of chartreuse and a touch of turquoise blue elevates one’s visual surprise and pleasure as does the white furniture frames embracing oversized floral print chintz. Thank you Dorothy for making a world that was drab and dreary into a colorful symphony of color, joyful prints, shiny black and dull white contrast, pristine white moldings, mirror and furniture frames de rigueur interior design. Hostels are full of friendly backpackers, a good source of dinner partners or someone to travel with for a while.